This is “Solving Linear Equations: Part I”, section 2.3 from the book Beginning Algebra (v. 1.0). For details on it (including licensing), click here. Identify linear equations with one variable and verify their solutions. 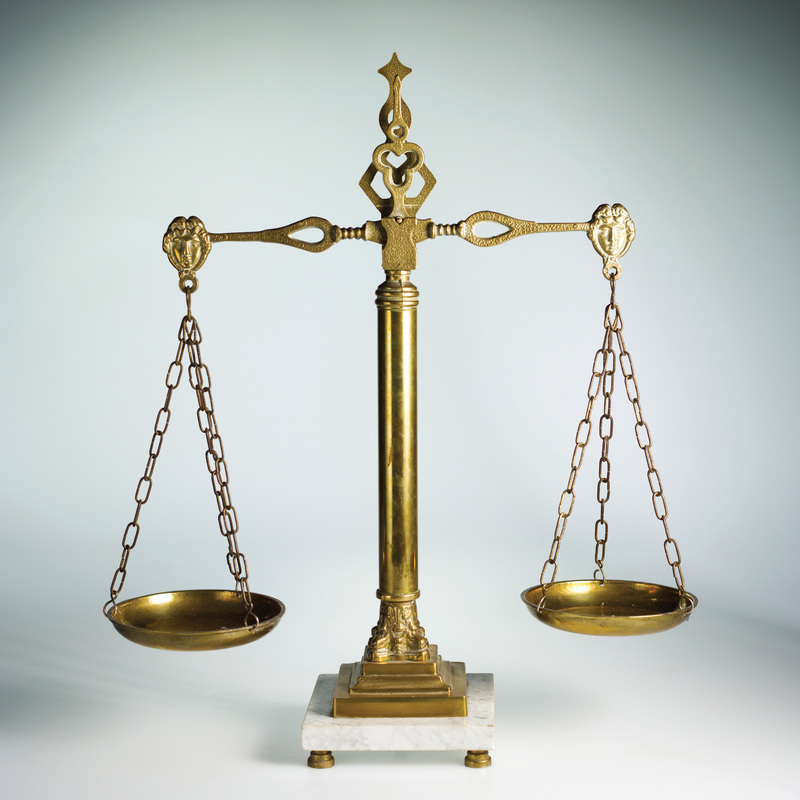 Use the properties of equality to solve basic linear equations. Use multiple steps to solve linear equations by isolating the variable. Solve linear equations where the coefficients are fractions or decimals. Learning how to solve various algebraic equations is one of the main goals in algebra. This section introduces the basic techniques used for solving linear equations with one variable. A solutionAny value that can replace the variable in an equation to produce a true statement. to a linear equation is any value that can replace the variable to produce a true statement. The variable in the linear equation 2x+3=13 is x, and the solution is x=5. To verify this, substitute the value 5 for x and check that you obtain a true statement. Alternatively, when an equation is equal to a constant, we can verify a solution by substituting the value for the variable and show that the result is equal to that constant. In this sense, we say that solutions satisfy the equationAfter replacing the variable with a solution and simplifying, it produces a true statement.. Example 1: Is x=3 a solution to −2x−3=−9? Answer: Yes, it is a solution, because x=3 satisfies the equation. Example 2: Is a=−12 a solution to −10a+5=25? Answer: No, it is not a solution, because a=−12 does not satisfy the equation. Recall that when evaluating expressions, it is a good practice to first replace all variables with parentheses, then substitute the appropriate values. By making use of parentheses we avoid some common errors when working the order of operations. Example 3: Is y=−3 a solution to 2y−5=−y−14? Answer: Yes, it is a solution, because y=−3 produces a true statement. Try this! Is x=−3 a solution to −2x+5=−1? We begin by defining equivalent equationsEquations with the same solution set. as equations with the same solution set. Consider the following two linear equations and check to see if the solution is x=7. Multiplying or dividing both sides of an equation by 0 is carefully avoided. Dividing by 0 is undefined and multiplying both sides by 0 results in the equation 0 = 0. To summarize, equality is retained and you obtain an equivalent equation if you add, subtract, multiply, or divide both sides of an equation by any nonzero real number. The technique for solving linear equations involves applying these properties in order to isolate the variable on one side of the equation. If the linear equation has a constant term, then we add to or subtract it from both sides of the equation to obtain an equivalent equation where the variable term is isolated. Solution: To isolate the variable x on the left side, subtract 3 from both sides. Answer: The solution is x=−8. To check that this is true, substitute −8 into the original equation and simplify to see that it is satisfied: x+3=−8+3=−5 ✓. In the previous example, after subtracting 3 from both sides, you get x+0=−8. By the additive identity property of real numbers, this is equivalent to x=−8. This step is often left out in the presentation of the solution. If the variable term of the equation (including the coefficient) is isolated, then apply the multiplication or division property of equality to obtain an equivalent equation with the variable isolated. In other words, our goal is to obtain an equivalent equation with x or 1x isolated on one side of the equal sign. Solution: The coefficient of x is –5, so divide both sides by −5. Answer: The solution is x=7. Perform the check mentally by substituting 7 for x in the original equation. In the previous example, after dividing both sides by −5, x is left with a coefficient of 1, because −5−5=1. In fact, when we say “isolate the variable,” we mean to change the coefficient of the variable to 1, because 1x=7 is equivalent to x=7. This step is often left out of the instructional examples even though its omission is sometimes a source of confusion. The equation 2=x is equivalent to x=2. It does not matter on which side we choose to isolate the variable. Solution: Isolate the variable x by subtracting 5 from both sides of the equation. Answer: The solution is −3, and checking the solution shows that 2 = 5 − 3. A linear equation of the form ax+b=c takes two steps to solve. First, use the appropriate equality property of addition or subtraction to isolate the variable term. Next, isolate the variable using the equality property of multiplication or division. Checking solutions in the following examples is left to the reader. Answer: The solution is 10. Answer: The solution is −113. Solution: When no sign precedes the term, it is understood to be positive. In other words, think of this as +6−5y=−14. 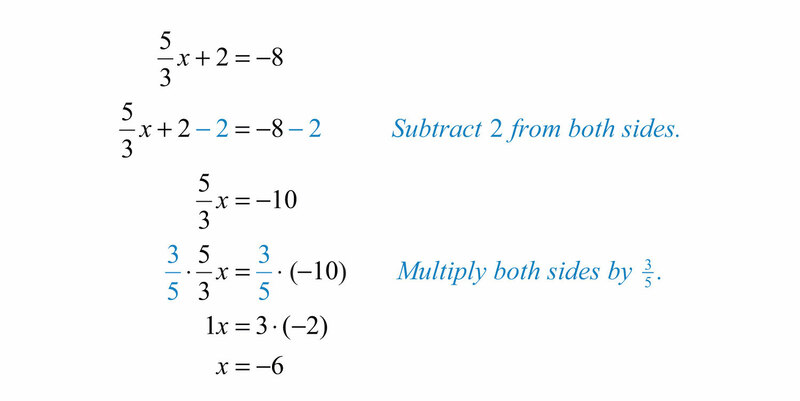 Begin by subtracting 6 from both sides of the equal sign. Answer: The solution is 4. Answer: The solution is 118. Recall that −y is equivalent to −1y; divide both sides of the equation by −1. Answer: The solution is 2. 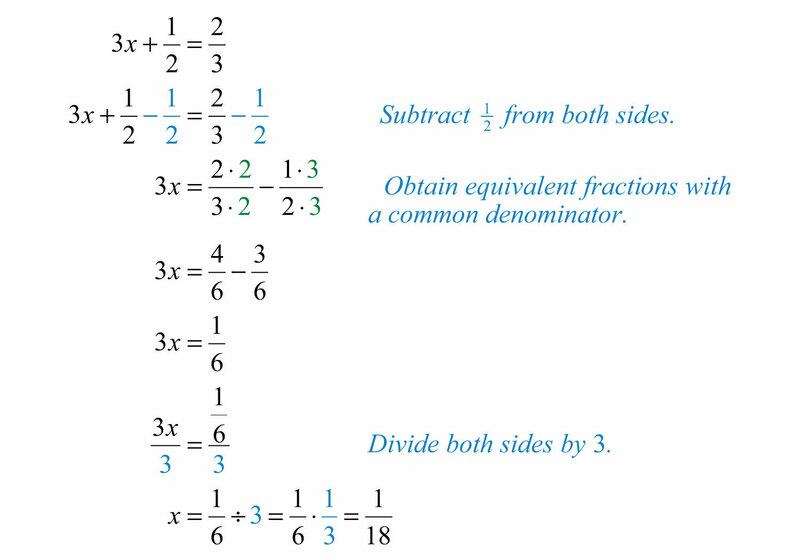 In summary, to retain equivalent equations, we must perform the same operation on both sides of the equation. First, apply the addition or subtraction property of equality to isolate the variable term and then apply the multiplication or division property of equality to isolate the variable on one side of the equation. On the left side of the equal sign, the fraction cancels. On the right side, we have a complex fraction and multiply by the reciprocal of the coefficient. You can save a step by recognizing this and start by multiplying both sides of the equation by the reciprocal of the coefficient. Recall that the product of reciprocals is 1, in this case 43⋅34=1, leaving the variable isolated. Solution: Isolate the variable term using the addition property of equality and then multiply both sides of the equation by the reciprocal of the coefficient 53. Answer: The solution is −6. The reciprocal of −45 is −54 because (−54)(−45)=+2020=1. Therefore, to isolate the variable x, multiply both sides by −54. Answer: The solution is −25. Linear equations with one variable can be written in the form ax+b=0, where a and b are real numbers and a≠0. To “solve a linear equation” means to find a numerical value that can replace the variable and produce a true statement. The properties of equality provide tools for isolating the variable and solving equations. To solve a linear equation, first isolate the variable term by adding the opposite of the constant term to both sides of the equation. Then isolate the variable by dividing both sides of the equation by its coefficient. After isolating a variable term with a fraction coefficient, solve by multiplying both sides by the reciprocal of the coefficient. Is the given value a solution to the linear equation? Translate the following sentences into linear equations and then solve. 73. The sum of 2x and 5 is equal to 15. 74. The sum of −3x and 7 is equal to 14. 75. The difference of 5x and 6 is equal to 4. 76. Twelve times x is equal to 36. 77. A number n divided by 8 is 5. 78. Six subtracted from two times a number x is 12. 79. Four added to three times a number n is 25. 80. Three-fourths of a number x is 9. 81. Negative two-thirds times a number x is equal to 20. 82. One-half of a number x plus 3 is equal to 10. 87. How many steps are needed to solve any equation of the form ax+b=c? Explain. 88. Instead of dividing by 6 when 6x=12, could you multiply by the reciprocal of 6? Does this always work?